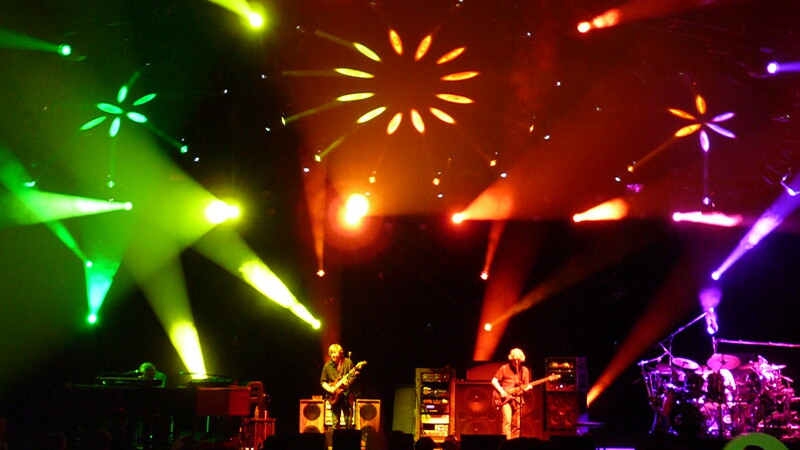 With the Gorge exactly one week away, let’s take the final Friday before tour to review a few seminal jams that have gone down at both the Gorge and leg two’s closing locale, UIC Pavilion. Though some of these tracks have been posted before, they have the type of timeless staying power to warrant hearing again. A five-five split between the Gorge and UIC brings the last week before tour to an end. Enjoy the music…leg two awaits! Over the past two weeks, including the 2011 installment Ten Tunes For Friday that kicked off the celebration of this summer, we have looked at many of the band’s stellar moments from the opening leg. Today we wind down our capsule reviews of the standout jams from June as we prepare ourselves to take in many more highlights during August. Another in the series of Summer 2011 “Down With Diseases,” this version provided the highlight of Alpharetta’s opening night. Tearing out of the composition with a well-phrased solo, Trey led the band through some momentum-building rock and roll. Soaring at a breakneck pace, Mike dropped thunderous bass lines behind the high-sped jaunt. 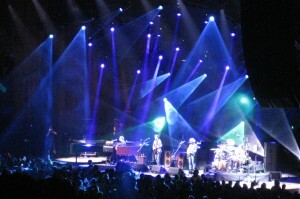 Breaking the sprint, Trey switched it up in with a series of rhythms chops that brought the band into uncharted waters. Page hopped on his Rhodes while the band shifted gears into a percussive texture with Fishman acting as the anchor of the jam. Gradually, the band oozed into a more abstract-then-ambient conversation, building the jam outwards and into a spacier milieu. 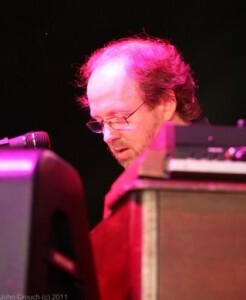 Fishman’s beats carried through this experimental playing, grounding the band’s abstract playing with hard rhythms. 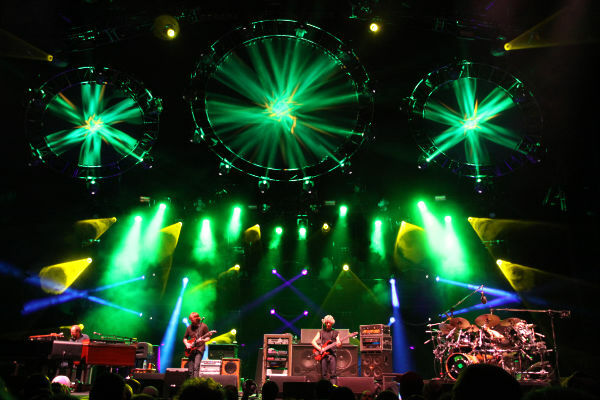 Within the last couple minutes of the jam, Phish got into some seriously “Storage-esque” territory, foreshadowing their emerging improvisational style while touching the outer rings of the galaxy. As Fishman came in with the opening hi-hat to “Maze,” the band had found their landing point. Taking the momentum from this creative trek and injecting it directly into “Maze,” Phish tore apart a version that sounded akin in intensity and communication to its mid-Nineties predecessors. 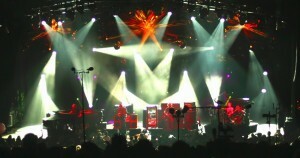 Both Trey and Page’s solo smoked and the rest of the band contributed to complex and creative backing canvas. Coming to a face-melting peak with Trey’s solo and accompanying effects, Phish totally annihilated this “Maze,” getting in touch with the song’s essence of madness and musical mania. On the first night of tour, Phish had just finished a stunning sequence of “Waves > Caspian” when they dropped into a deep-second-set “Crosseyed.” Juxtaposing the abstract and enchanting journey of “Waves”with a fire-filled and seething rendition of “Crosseyed,” the band had gone for the jugular on the first night of tour. But the most engaging music of this piece came once band reprised “Still waiting…” and collectively slowed into demonic territory. Maintaining a beat behind this menacing music, Fishman gave this section a danceable cadence as the other three members dove into the underworld. Toying with a chord progression that echoed the murky end of Walnut Creek’s epic “Mike’s” jam from 1997. It was the first night 2011 Phish, and things were already flying off the meat rack. During the opening leg of summer (and Super Ball), Phish played a total of six “Sands,” and every single one smoked. The second of these six came in Merriweather Post Pavilion’s first of four sets, and stood out right away with its jazz-based, lockstep interplay. Launching into the jam with a smooth be-bop lick, Trey set a jazzy tone right from the get go. While Page clavved like his life depended on it, Mike stepped up and responded to Trey’s thoughtful riffs with those of his own. In laid-back, co-leadership, the guitarists maintained the spotlight during this rendition, As the band progressed from their swanky interplay into a more aggressive exchanges, Page hopped to piano and joined in the fray. 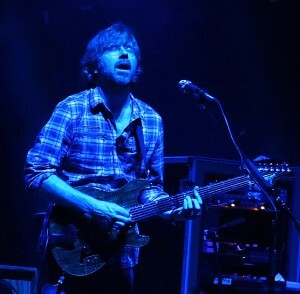 The whole band maintained a sharp focus as they collectively reached a peak in which Trey released “cries of terror” from his guitar—an effect he used throughout the tour. Though everyone will have their favorite version from tour, Merriweather’s excursion in jazz-fusion stood out immediately upon relisten. After the incredibly successful summer that Phish has already had, we still have a dozen shows to go! 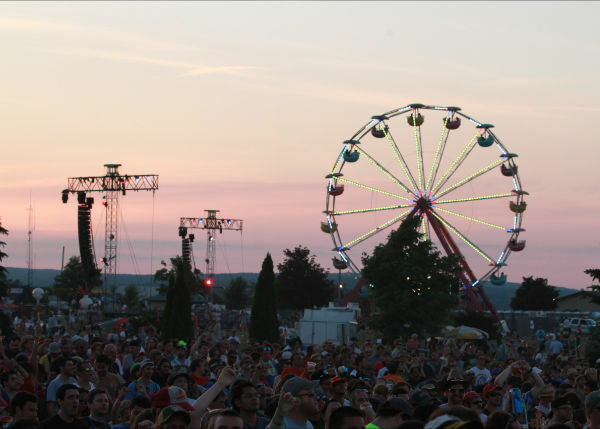 In a bit more than a week the circus will travel to the hallowed grounds of the Gorge to kick off the back end of the touring season. And things couldn’t look brighter. 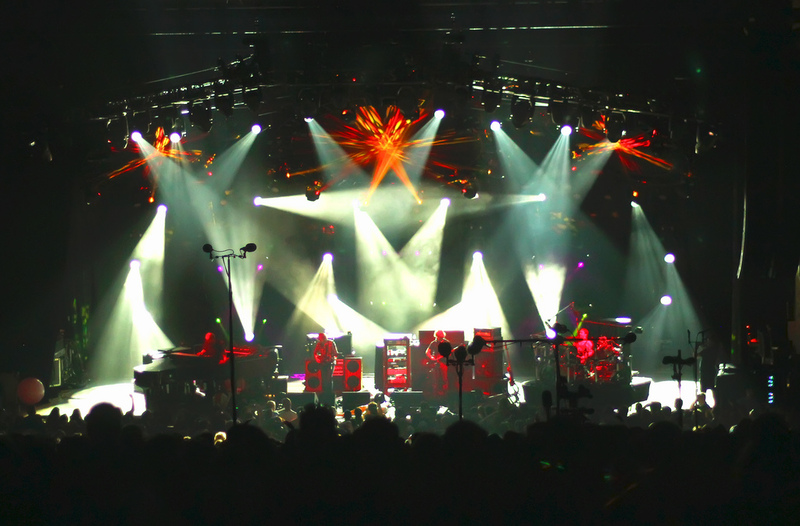 When we left the band just a few weeks ago, they had just thrown down the best weekend of music in the modern era amidst a full-blown Phish festival of the sorts we only dreamed about a few short years ago. 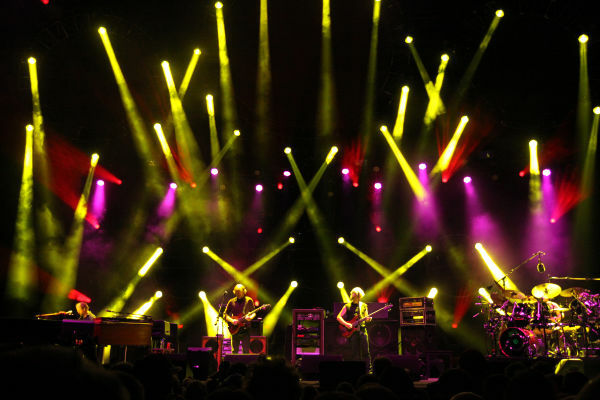 It is impossible to deny the musical momentum built over the first half of this summer and— more than ever—it certainly feels like the dawning of Phish’s Golden Age. 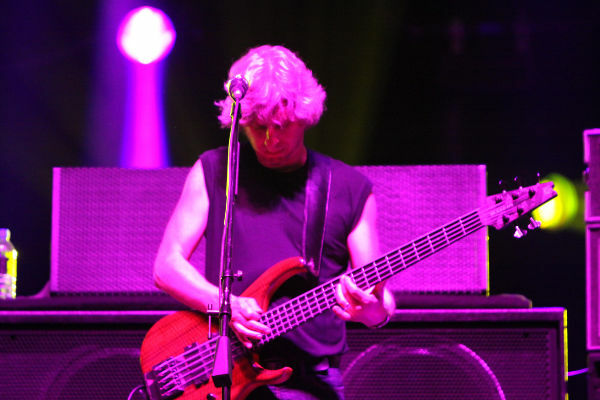 Full-blown creativity, new improvisational directions, experimental jamming, airtight communication, uncharted territory—all of these facets were part of Phish’s opening month of tour. And if the progress made from leg one to leg two during the past two summer tours is any indication, Phish is going to come back with even sharper jaws and enhanced improvisational adventure. At Super Ball, the band seemed to play with a laid-back patience, understanding that we were all there for three days and there was no reason to rush anything. As a result, almost almost no jams were ended prematurely and the weekend possessed an undeniable flow. Though some sets were better crafted than others, the band left us with a slew of the most innovative music to be played in this era. Two nights at the Gorge, Hollywood Bowl, Tahoe x 2, Golden Gate Park, then two three-packs—at UIC and Denver…there is heck of a lot of music left to be played this summer! And just like the last two, when all is said and done, my bet is that the second leg will produce the most memorable jams of the tour. Building off a spectacular June that was in a different league than its 2009 and 2010 predecessors, the thoughts of what might come out of August is awe-inducing. 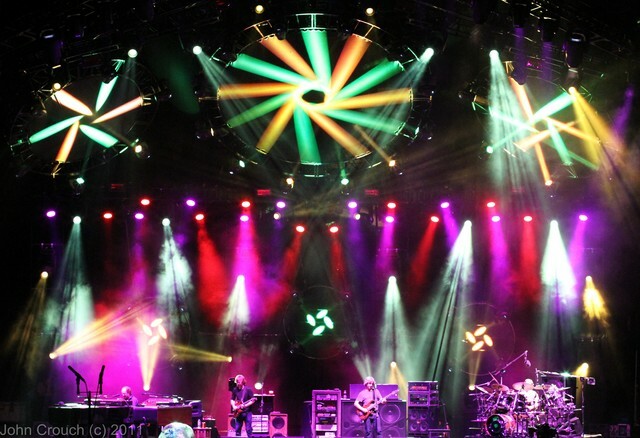 Five new venues and a return to two of their most classic haunts will provide us with 24 more sets to take us through a Phishless fall. But something tells me that after a spectacular—and lengthy—summer, that won’t be too much of a problem for anyone. In 2011, Phish has created a buzz in the community like no time since their Hampton return. 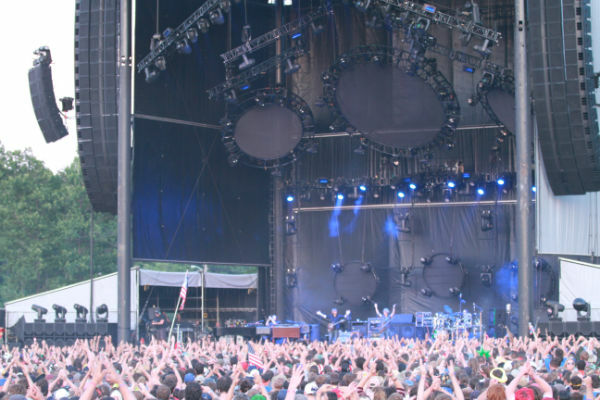 Showcasing a completely revitalized improvisational brilliance—built upon the foundation of ’09 and ’10—Phish took people by storm in Bethel and have maintained that quality of play, and improved upon it, right up through Super Ball. It’s an exciting time to be a Phish fan, as the entire comeback has brought us to right now. And heading up to the Gorge in this context, could anything be sweeter? 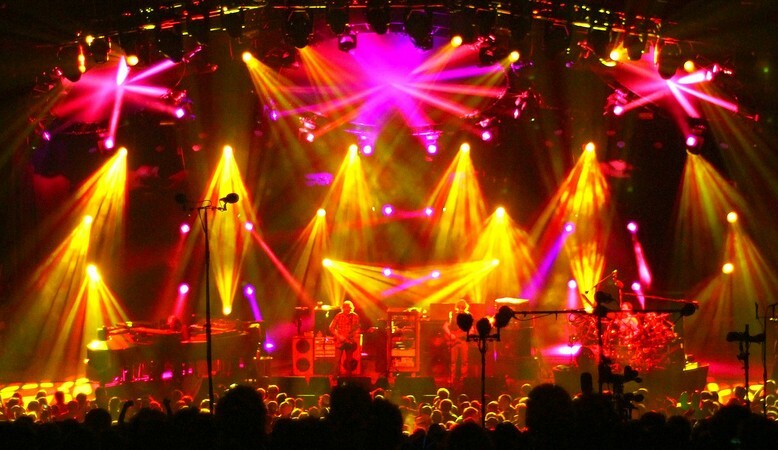 Deep in Portsmouth’s second set, Phish got into an intricate and psychedelic take on “Light” in which Trey actually sets up a quasi-transition into “Number Line.” With so much meat in his show, this “Light” jam hasn’t been discussed to much; check it out. Phish’s Camden performance boasted little flow, several obvious flubs and wound up as one of the lower tier shows of summer’s opening leg. 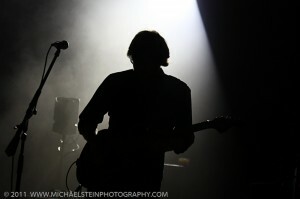 But during June 2011, even the band’s lesser engaging nights still carried strokes of brilliance. When at a show, its whole contour often strikes one more than its individual parts, but when listening back with the ability to focus in on one particular jam at a time, a recording can offer snapshots of greatness. Though its two-set dynamic never quite elevated, Camden’s show did offer some great musical nuggets. Despite strong first-set versions of “Weekapaug” and “Stash,” the following three jams represent, in my opinion, the most transcendent moments of a relatively underwhelming show. In the highlight of the first half, and arguably the show, Phish threw down a majestic, set-closing version of their seminal classic, “The Curtain With.” A fluttering beat from Fishman framed a passionate, three-part dance between Mike, Page, and Trey. The phrasing of all members took an emotional and virtuosic turn as their lines seemed played from the comb of a music box—intertwining with mind-boggling perfection. The band immersed themselves in a sacred exchange as their interplay dripped with a collective catharsis that you don’t hear every day. Camden represented the first time in the band’s career that they used “The Curtain With” to end a set; but after this rendition, there was simply nothing left to say. Though June featured many a standout “Disease,” Camden’s second-set opener is right up there with the best of them. Sprinting through high-speed rock textures, the band boasted the improvisational tightness we heard during “Curtain (With),” and as they veered off course, it was clear an adventure was ahead. Settling into a sparser canvas, the band’s offerings seemed to chase each other in a game of musical tag. Trey’s lines slowly grew more abstract, while Page and Mike went along this spiritual climb with him. Fish’s driving break-beats gave way to more delicate rhythms, and quickly, the band was amidst stunning original interplay. As the music developed out of this mellifluous realm and into more psychedelic waters, Mike and Page lead the jam as much as Trey. Then after stepping back, Red emerged with an uncompressed growl over an increasingly dynamic groove—and within this section lies some of June’s more impressive jamming that has largely been lost in the fray. Ending naturally in “Free,” this “Disease” is pure exploratory fire. Though the rest of the set didn’t exactly blow the roof off Camden’s Susquehanna Bank Center, this “Disease” most certainly did. While we are revisting Camden, here is the “Stash” that followed the show’s opening “Mike’s Groove,” a dark slice of jamming at the beginning of the night . On the last day of Super Ball, Phish not only threw down one of the most impressive second sets of the summer, they also played quite the first. 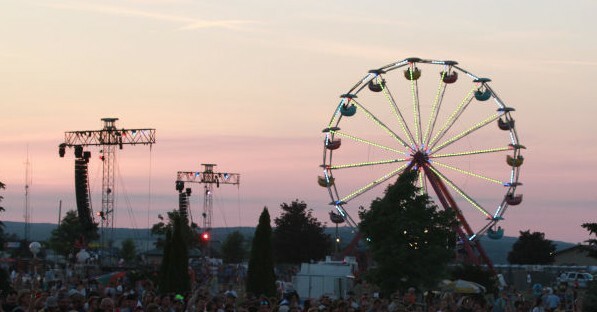 With shrewd song selection, engaging interplay, and extra zest added to every piece, Phish unveiled—without question—the strongest opening set of the year, and many fan’s pick for their favorite set of the entire festival. Having already reviewed the wildly creative second set of July 3rd, let’s look back at this monster that kicked off Super Ball’s finale. Of the six times Phish has played Bob Marley’s “Soul Shakedown Party,” three have been openers and a sure sign that a big-time night is ahead. Debuted as the first song at their legendary show on 2.17.97 at Amsterdam’s Paradiso, other opening versions came on 4.17.04 (sure—not exactly an instant classic) and 12.30.09. 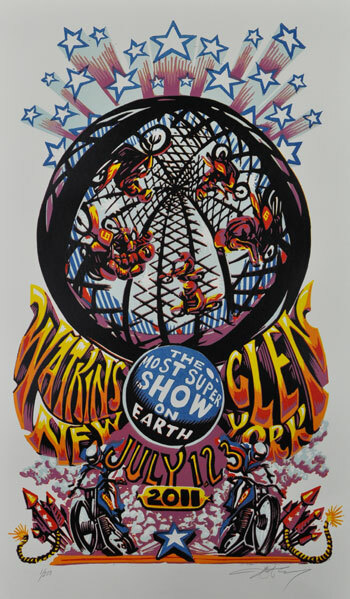 And when the opening notes of Marley’s original rang out over the concert field at Watkins Glen on the evening of July 3rd, we knew that were in for a treat. Busting into the old-school combination of “AC/DC Bag” and “The Curtain,” Phish set a retro tone for their opening stanza—a thread they would weave throughout the entire set. As the band wound down the final hits of their composition, everyone expected to hear “With,” but they threw us a left hook in the form of “Colonel Forbin’s!” For the first time since returning to the stage, the band used “The Curtain” as a composed “launch pad” into another song—a use popularized throughout their career. With the special vibe that defined Super Ball all weekend long, as Phish precisely played their Gamehendge classic, one could feel the oncoming narration. And just as they hit the crossroads, Trey let go of his guitar before “Mockingbird” for the first time since Vegas 2000, and he began to spin a yarn. Trey told a tale from ancient band history; a self-avowed true occurrence when they inadvertently locked themselves in their storage shed. With a lack of anything else to do—and no immediate way out—the band proceeded to break out their instruments and jam. 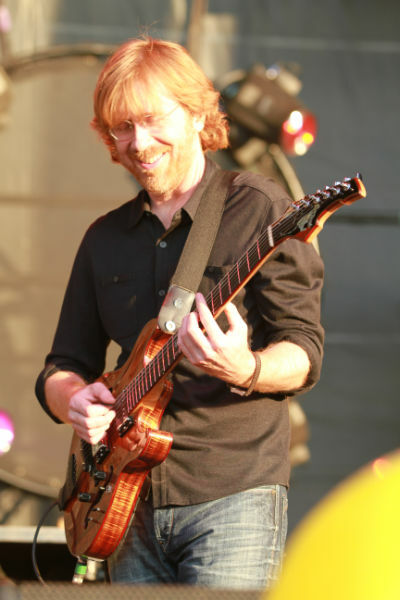 Twisting the story like only he can, Trey jokingly explained that the entire festival was a projected reality of the band’s consciousness from their storage shed back in the day. And when the festival ended—and the band got released from their captivity—no one would have any recollection of the weekend. 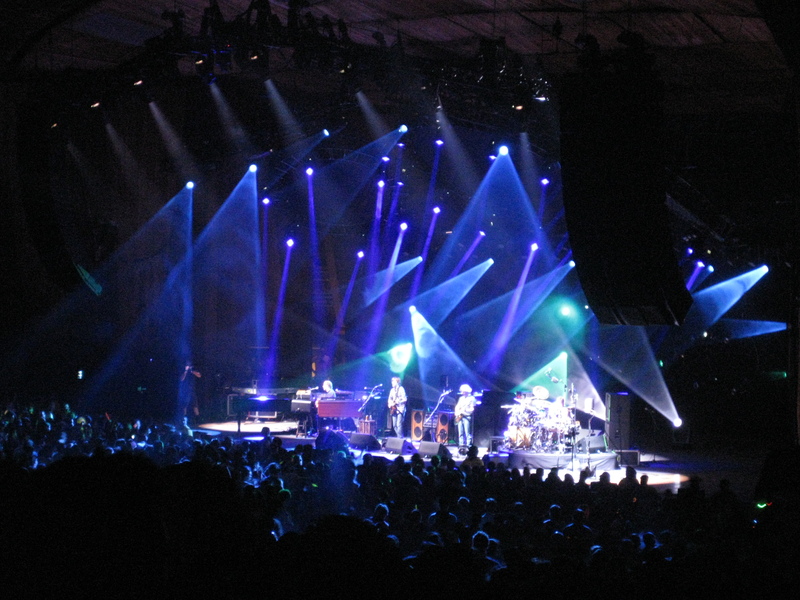 A quintessential tale that blended fact, fiction, lore, and humor with our actual experiences of the weekend, Trey continued the old-school feel of the set without even playing a note. But when Phish got back to music, they were all business. But the climax of this torrid set came in the unlikely and (once again) old-school one-two punch of “Reba” and “David Bowie.” Daytime “Rebas” have provided vivid festival memories since The Clifford Ball’s immaculate Sunday version. Followed three years later by Oswego’s dusk performance and in 2003, by IT’s phenomenal afternoon rendition, it had been a while since a daytime festival set and “Reba” collided. But when this happened at Super Ball, one of the defining versions of the modern era resulted. Tearing off an adrenalized and intricate version of yet another ancient opus, Phish underlined the vintage quality of this stanza. The outstanding communication and creativity that was on display throughout this frame flooded the final jam and the guys shredded a fierce take of their classic, moving from feel-good textures into far more harrowing territory before delivering the demonic tale to its final shrills. A thrilling exclamation point on a near-perfect set, “Bowie’s” airtight excursion dropped the hammer on a stunning first half of what would soon become one Phish’s best two-set shows since their return. In my humble opinion, the most overlooked piece of musical mastery to come from summer’s opening leg is PNC’s “Drowned.” These shows were sandwiched between Bethel and the Midwest, and since the second night turned into a TreyDHD-fest, PNC’s opening night has been largely glossed over. But the “Drowned” in the middle of the second set should be hailed as a seminal piece of 2011 improv. Foreshadowing the type of sonic exploration featured in Super Ball’s hallowed Storage Jam, Phish dove into the abyss during this piece with gorgeous interplay—a track that must be on any legitimate Leg One playlist. 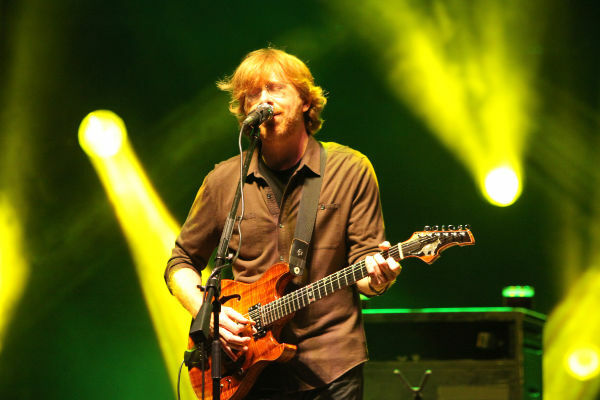 After the song’s straightforward launch, Trey pulled up his searing solo as if pulling the reins of a horse, and the band slowed into a murky texture almost immediately. Phish morphed into a spacey groove that featured Mike out front and delicate interplay between the entire quartet. Page offered a large effect as the jam grew increasingly ambient, transforming into an exploration of harmony, sound and tonal color. Though the jam reached uber-abstract territory, the band’s cohesion never wavered (much like the late-night Storage Jam). Trey dotted the band’s sonic backdrop with soulful melodies in a stunning convergence of four minds. Transforming into heart-tugging soundscapes, this emotive space jam provided some of the most enchanting music of tour while plunging the depths of experimentation. 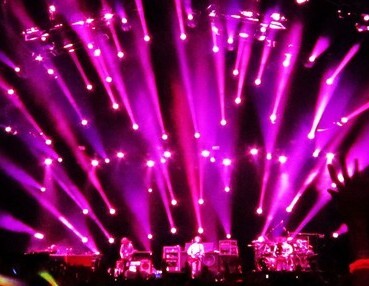 Spilling into “Maze,” this combo lit-up the middle of PNC’s hugely underrated opener. 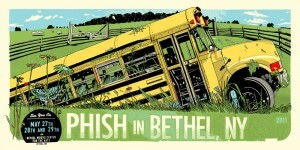 Phish punctuated the first set of Bethel’s Saturday night revelation with one of the show’s outstanding jams, “Bathtub Gin,” and this version was laced with something special from the get-go. Jumping directly into action as soon as the jam dropped, Mike’s chunky bass lines forged a path for Trey’s original melodies while Fish’s intricate beats—drenched with with stops and fills—guided the whole. As the piece began to blossom, Trey effortlessly tore off original licks amidst a slow and groovy milieu. From this juncture it became quite evident that the band’s communication was locked into the “On” position for the evening. 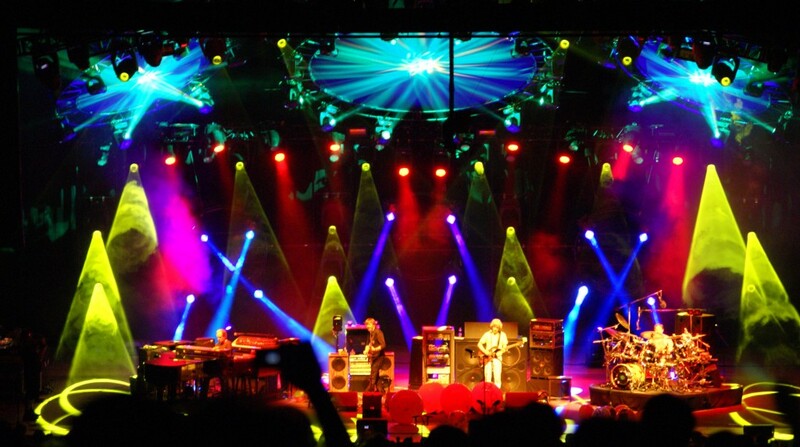 Trey’s staccato licks pushed the band out of their comfort zone and the urged the jam into a more intense dimension. Gradually climbing into a cathartic peak of pure, top-shelf “Gin,” the band converged in masterful communication and musical annihilation. And this is where most versions of 3.0 have come to an end—but not at Bethel. 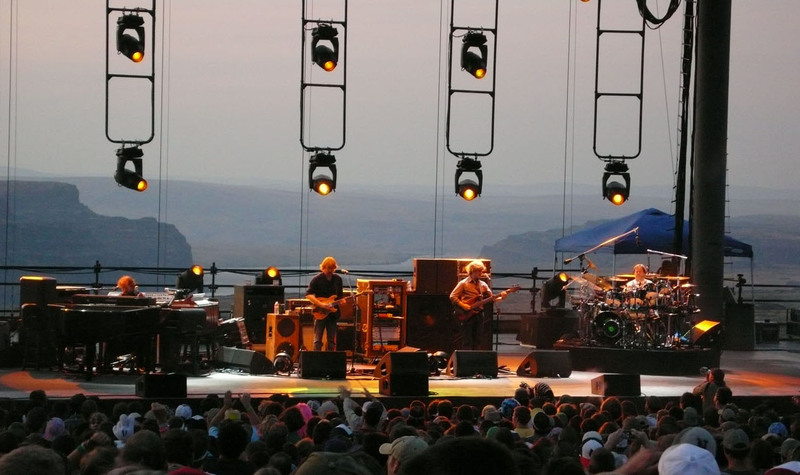 Following the peak, Trey immediately revved up a new sequence of uptempo grooves. 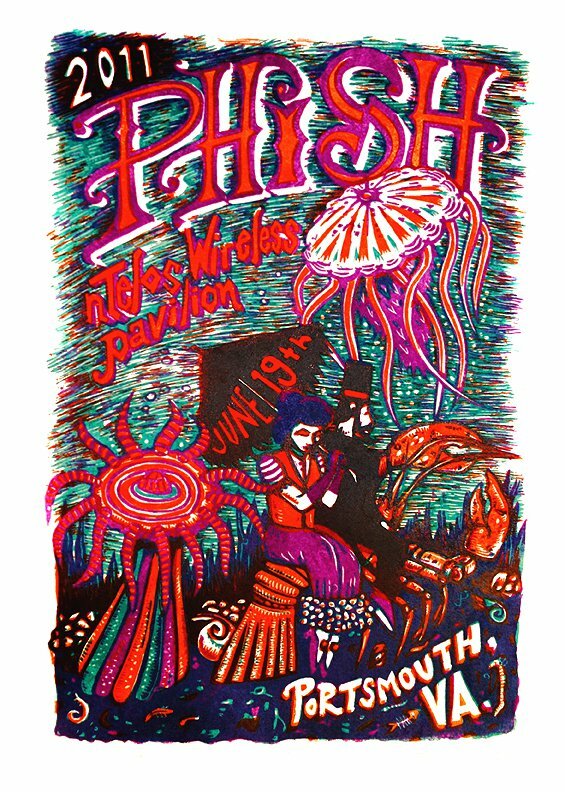 Mike and Fish sculpted a speedy pocket that sounded very similar to “Golden Age,” but Phish soon uncovered their intentions. The band careened into a breakneck version of “Manteca” over these slamming rhythms and Mike began to pump furious, enveloped-filtered notes into the fiendishly addictive groove. And just like that, the band meshed back into “Bathtub Gin’s” theme with a tidal wave of energy, teasing “Manteca” all the way to the end of this spectacular set closer. “Wolfman’s” is a song that saw Phish get more creative with it as the leg one continued, peaking with Super Ball’s sublime version. At Merriweather’s Sunday night show, Phish used the song as a vehicle for swanky grooves whose tempo moved a bit slower than usual. As the band was immersed in gooey textures, Mike played slowed-down bass lines that brought the music in a tangential direction. 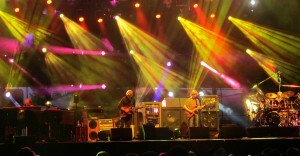 As the band reduced speed, Trey took the opportunity to introduce hints of ‘Boogie On’s” opening licks. And where the he might have obtrusively cut the jam off before, he patiently allowed the segue to develop into Stevie Wonder’s original. Usually, if “Wolfman’s” combines with “Boogie On,” “Wolfman’s will be the weighted half of the combo, but this night was different. A song that generally does very little for the path of a show with generic funk grooves that—more often than not—go nowhere, this performance would be different. Instead of treading water in repetative, vanilla rhythms, Page initiated a full-on funk throwdown with a single, effected note in his clav solo. The band hopped on for the ride and took the cover into far more engaging territory. 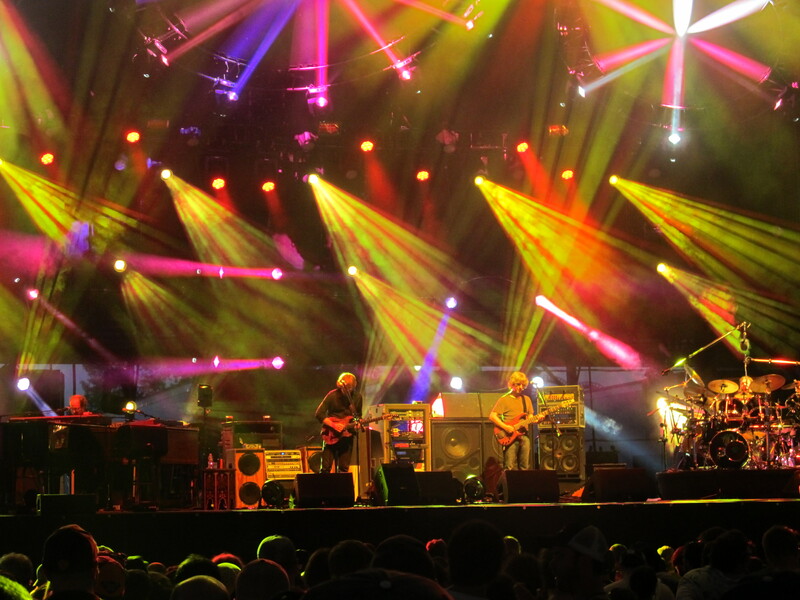 As Mike and Fish flipped the song’s rhythms inside out, Trey and Page began narrating a funkified tale over top. Laser-locked in this rhythmic exchange the band used “Boogie On” as a dose of mid-set adrenaline to satiate the groove junkies in the Columbia crowd. Coming as the mid-set resolution for a dark opening combo of “Crosseyed” and “Walls of the Cave,” Phish unveiled a stunning version of “Slave to the Traffic Light” in their tour closer. A placid opening featured a shimmering beat and quiet, yet very active, whole-band interplay. 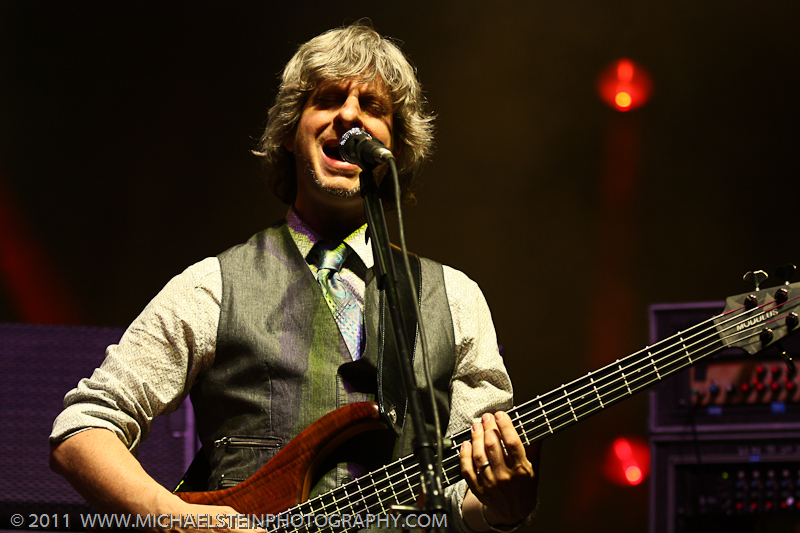 Mike’s bass lines stood out in this mellow plane as Trey built his solo atop of his contours. After playing many stellar “Slaves” throughout the summer’s opening leg, the final version of June absolutely took the cake with pure musical exultation . The soul and energy pouring through the band’s instruments was staggering, as the music was as refined as any you’ll ever hear. 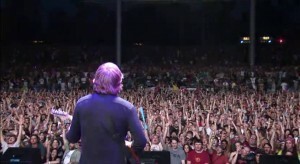 Trey featured an extended “fanning” section throughout the jam’s peak, adding a dramatic dimension to the mountaintop. And it was good. Check out this powerful article about out favorite guitar player, his public support for drug courts on Capitol Hill and how he got, yet, another standing ovation! 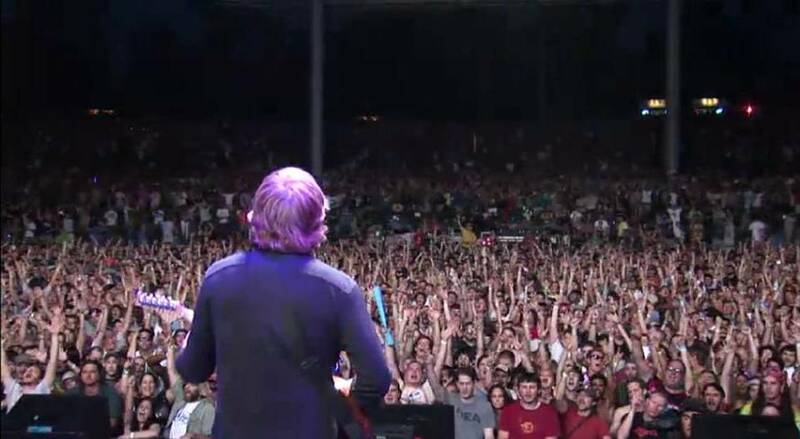 After Phish’s summer opening run at Bethel Woods grabbed the attention of fans across the nation and beyond, the band one-upped their performances in upstate New York with a spectacular show outside Detroit at the classic Pine Knob Amphitheatre. 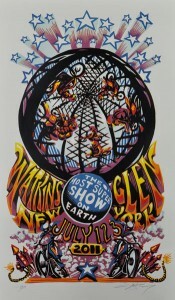 And at the center of this show lies the most impressive improvisational jaunt of the modern era—“Down With Disease.” Combined with its running mates of “Fluffhead” and “David Bowie,” this three-song combo that lasted a little under an hour not only centered the band’s most magical jamming of tour, but provided the type of exploratory, psychedelic, and spectacularly successful journey of which Phish legends are made. Connected, coherent, and weaving through so many masterful sections of creative improv, the band hasn’t again approached this level on stage majesty in front of an audience this summer. After just listening to this jam again, I can—honestly—make these bold statements with utmost confidence. 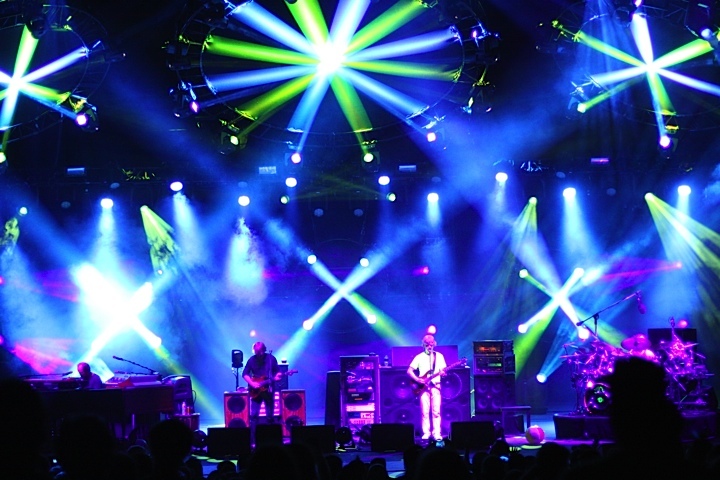 Phish has simply not connected more profoundly in the context of a normal show in this era than they did that night in Clarkston, Michigan. Not even close. And to make this an even more amazing fact, between June and Super Ball, Phish has spun so much amazing music that it’s mind-boggling. The redevelopment of the last two years is a distant memory and in 2011, Phish has again announced that there is no better band on the planet. And if anyone needs proof, cue up Detroit’s “Disease” and listen to the magic unfold. The guys patiently navigated a multi-tiered odyssey of the likes many thought would never happen again upon the band’s comeback in 2009. 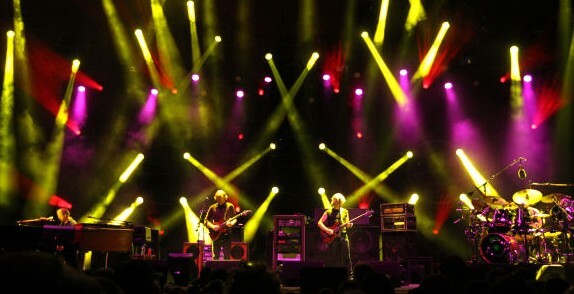 But in Summer 2011, June 3rd to be exact, Phish threw down a jam that holds up against anything they’ve ever played. 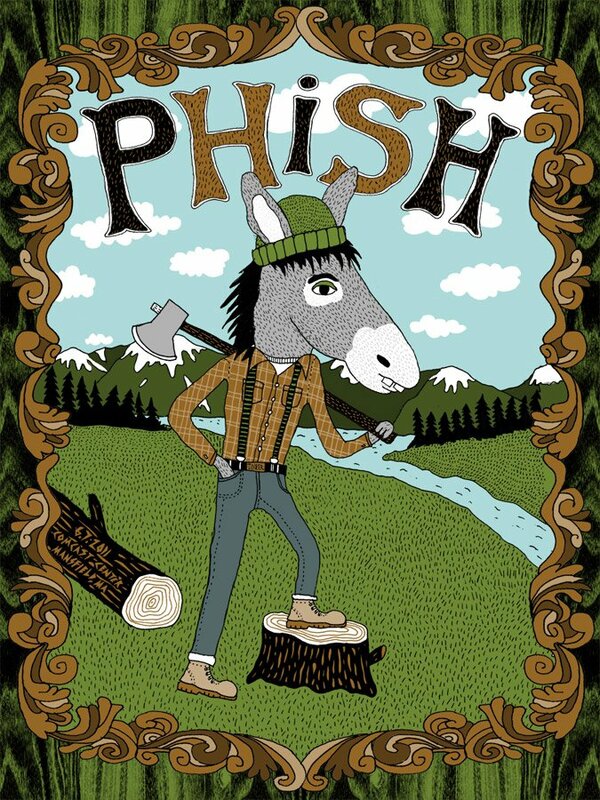 Adhered with a refined and delicate quality, this “Disease” illustrated a mature Phish that had honed their skill sets, blending them into a mind-numbing trek that travels through so many textures, feels and fantastic musical planes. Though many pieces this summer showcased the band’s revitalized jamming, none went down with more creativity and flat-out mastery than Detroit’s adventure. 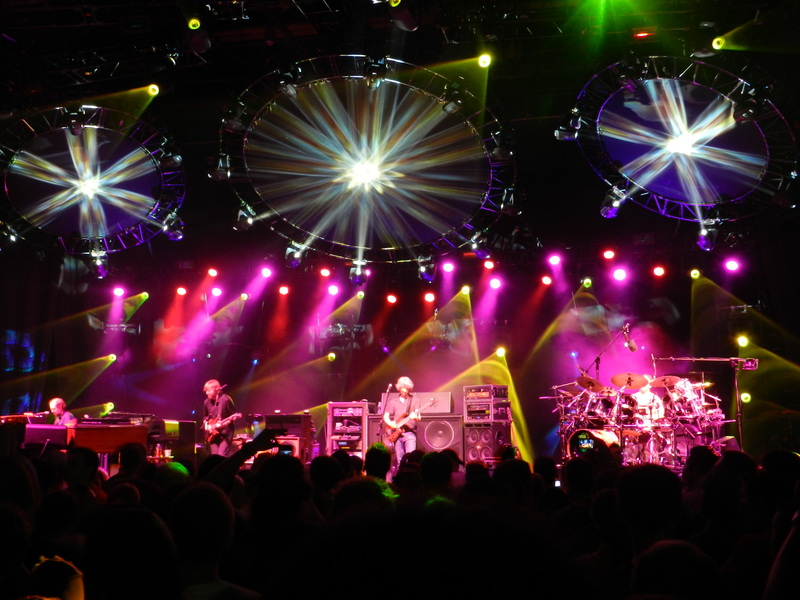 When Phish is at their best—throughout history—they have taken their time to explore music on a subconscious level without any preconceptions of where a jam should go or when they should move on to another song. And in Clarkston, on a Friday night in early June, that is exactly what they did, and what resulted was the most enchanting musical tale to spring from summer’s opening leg. I wonder what Leg Two holds in store? Continuing our look at the many standout jams of June, here is part two in a multi-part series. 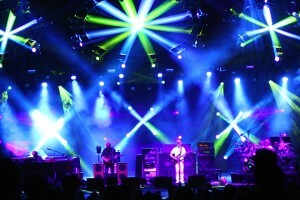 In the middle of Phish’s final set of June, they dropped into a jam that had stood out all month—”Sand. Having shredded multiple versions throughout leg one, Phish showcased the improvisational centerpiece as a primary part of their tour closer, and boy did it shine. Leaping into the fray with delicate, yet forceful leads, Trey grabbed Mike’s attention and both guitarists began to work symbiotically. Tearing of jazzy lick after jazzy lick, Trey speckled the hard groove with well-phrased melodies that Gordon responded to creatively. But as the intensity built, with all band members locked into the rhythmic excursion, the band took a step back from their cosmic climb to engage in some alternate interplay. As Phish took “Sand” on a tangential ride, Mike threw down heavy bass lines and Trey flowed like water while Page went clav-ing for dollars and Fishman held down a swanky rhythm. 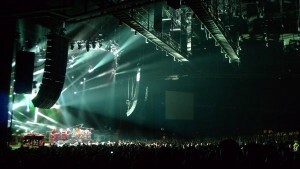 Entering uncharted territory, Phish was feeling IT and taking things were they were naturally moving. After getting into some crack-like, funk-jazz fusion, before anyone knew what was happening, the band had entered an infectious stop/start section of jamming that considerably juiced the Portsmouth crowd. And when the jam ended, Phish hadn’t had enough of their addictive groove as they jumped into a “Sand” reprise. Re-entering the same groove they had just left, the band had the audience in a full-out freak scene while chopping away some final dance rhythms. This summer’s “Pipers” have notably moved in variant directions, shying from the break-neck percussive grooves that have so often defined the jam in this era. No version from leg one better illustrates this welcome shift more than Blossom’s concise type-II adventure. Taking negligible time to move beyond Trey’s guitar solo and into original music, Phish settled onto a beautiful canvas. Combining in a melodic ball of light, all four band members reached an experimental plane right away—a perfect example of this summer’s creative intent and “to-the-point” improvisational style. Getting very creative very quickly, the guys used a succinct jam to explore their ideas before blending seamlessly into the only “Lizards” of tour. “After Midnight” will always bring vibrant memories of Big Cypress, the afternoon before the main event, and—of course—the song’s sacred reprise out of “Drowned” in the middle of the night. 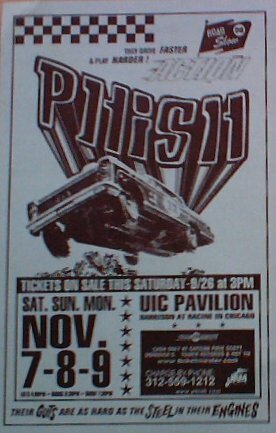 Played only twice since the dawn of the new millennium (in Manchester on 11.26.10 and New York on 12.31.10), neither version was used as a jam vehicle. 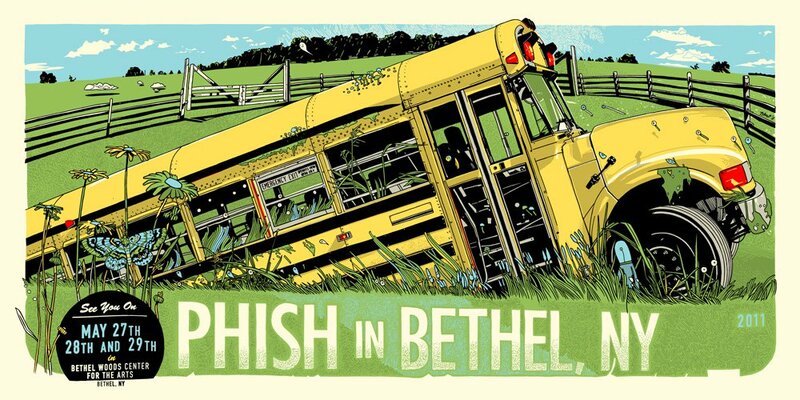 But when Phish came out at PNC—hot off of Bethel’s smoking run—and opened the second set with the J.J. Cale cover, one got the sense that this version would contain a legitimate adventure. As the band tore into the song’s groovy textures with fire, they built up a considerable head of steam along the way. After bringing the lyrics back—the point where the song would usually wrap up—the band had other ideas. Building off the song’s rhythmic template, the guys started to improvise, slowly migrating from the piece’s foundation. 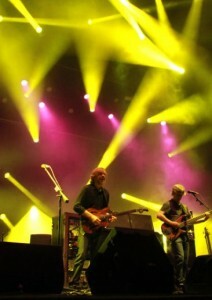 Trey began altering his licks and Mike responded while, simultaneously, adhering to Fishman’s beat. Gradually, Phish moved further and further from the groove until Fishman and Mike switched up the pocket and the quartet entered a more enchanting passage. 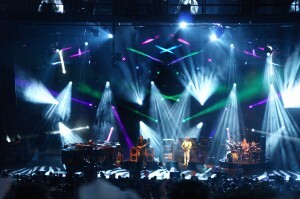 Trey repeated a cathartic melody over unique and outstanding rhythms churned out by Gordon and Fish. The band had once again found a musical field of dreams and converged in a gorgeous improvisational sequence. Moving in a more ambient direction as the piece progressed, with “After Midnight,” it became clear that the jamming on display at Bethel was hardly an aberration and that Phish 2011 had truly arrived. Toward the end of a bizarre second set in Raleigh—one that possessed great music but flowed like a pile of bricks—Phish unveiled the second “Split” of the summer. Coming like a psychedelic breath of air into a set that desperately needed one after “My Friend” and “Kill Devil Falls,” the opening beats of the song sparked immediate excitement. And by the time they came out on the other side, the band had pushed through a demented reality. Mike took control of the jam early with big, round bass lines that featured a patient tempo and fewer—perfectly placed—notes. The band’s first turn was for the sublime as they flipped the song into a major key, a move that brought a momentary dose of uplifting music. But the guys delved right back into the occult with abstract bass and guitar lines while Page comped dark piano chords in this increasingly menacing exploration. The band reached an abstract realm of “amoeba” jamming where eachmember pushed and pulled the music in variant directions without losing the cohesive whole. At this juncture the piece transformed into a mind-melting symphony and things would only get crazier from here. 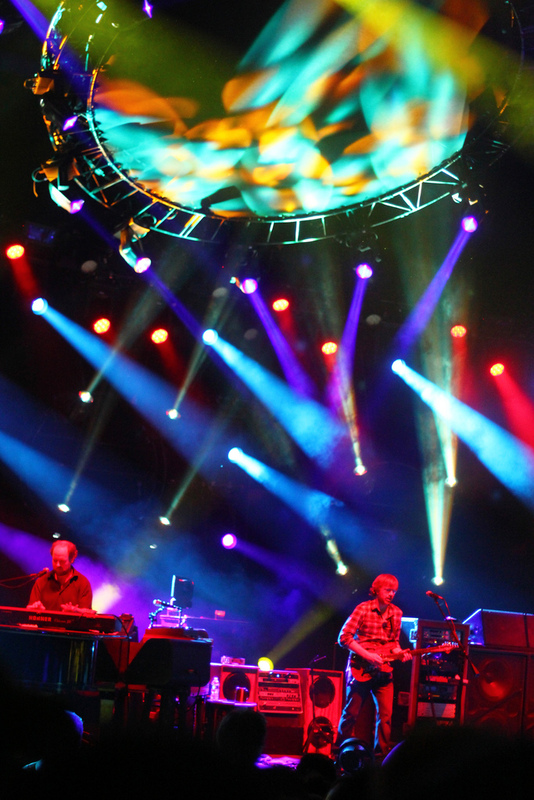 Mike and Fishman held a gooey rhythmic pattern as Trey and Page experimented over top—and then things got straight evil. 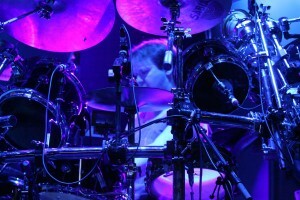 Fish entered an almost tribal beat while Page added a dark, futuristic sound effect in a confluence of sinister sounds. 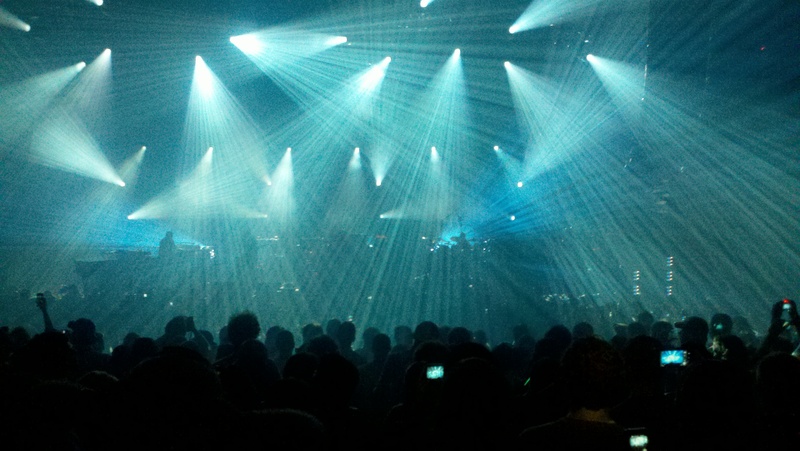 Bringing the piece to a drone, ambient near-silence, Phish was amidst the most exploratory and surreal “Split” they had played in ages. As the band continued to bring the jam into more abstract territory, when it came time to build back into the song, it wasn’t so easy. As they struggled to get from the far-out musical places they had reached back to a seething build, the band hit the eject button and popped out of the attempt with a quick ending. After a ridiculously dark jam that brought the crowd into depths of lunacy, the ending was but a small blemish on an overall terrorizing ride. Due to the copious amount of great music that came out of summer’s opening leg, one jam has been notably missing from many discussions of top-shelf highlights from June. After three-nights of fire in the Midwest, Phish returned to the east coast for a mid-week stop in Great Woods. Sandwiched between their Midwestern throwdown and a groovalicious night in Darien, its not surprising that Great Woods—a venue that should be renamed Mediocre Woods for this era—has been glossed over. Thought there wasn’t a lot of highlight material at Mansfield compared to other shows of June, but towards the beginning of the second set, Phish threw down a version of “Rock and Roll” that stands up to just about anything played over the entire tour. Before the band had even launched from the song’s classic rock textures, creativity defined their interplay. 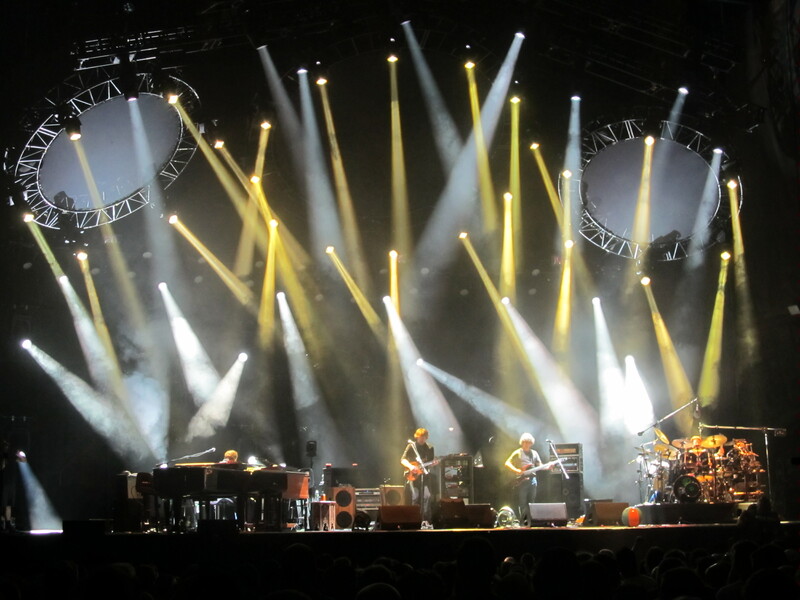 As Trey annihilated his solo, his band mates were similarly crushing the piece—Page on piano and Mike dropping high-octane bass lines—in a showcase of torrid energy. And though the band was connected early on in this standout jam, things got far more interesting once they entered uncharted territory. Flowing into a sparser musical texture, Mike took the lead with bold offerings as Page hopped up to his clav and Trey chopped atypical rhythms licks over a powerfully rolling beat. The band’s fluent communication translated right into this new sequence, and as they, collectively, slowed the jam down, the music grew more engaging by the moment. Once they reached a certain tempo, the guys quickly launched into abstract, melodic interplay as Trey wove his lines over Fish’s ultra-delicate breakbeats. If the band was locked to begin with, by this juncture they were Krazy-glued together and fully tapped into to the source. Trey entered his spiritual register, repeating a melody from the gods over an increasingly ambient backdrop. 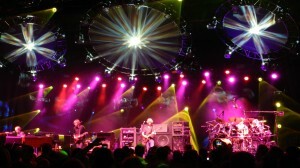 And as the band converged around Trey’s theme, they immersed the audience in bliss. Moving as a single entity, the Phish had reached a golden moment. But the jam only stayed uplifting for so long. 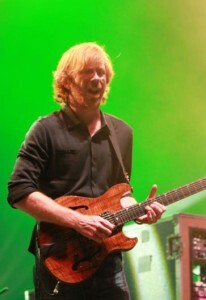 As Trey tore off one sinister lick, the entire piece took a turn for the dark side. 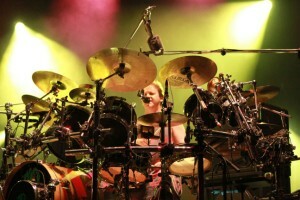 Mike and Fishman formed an intricate unique pocket, as Fish continued his standout playing. Trey unleashed seething guitar lines over these rhythms and the band dove into a menacing experiment, considerably upping the intensity of the music. 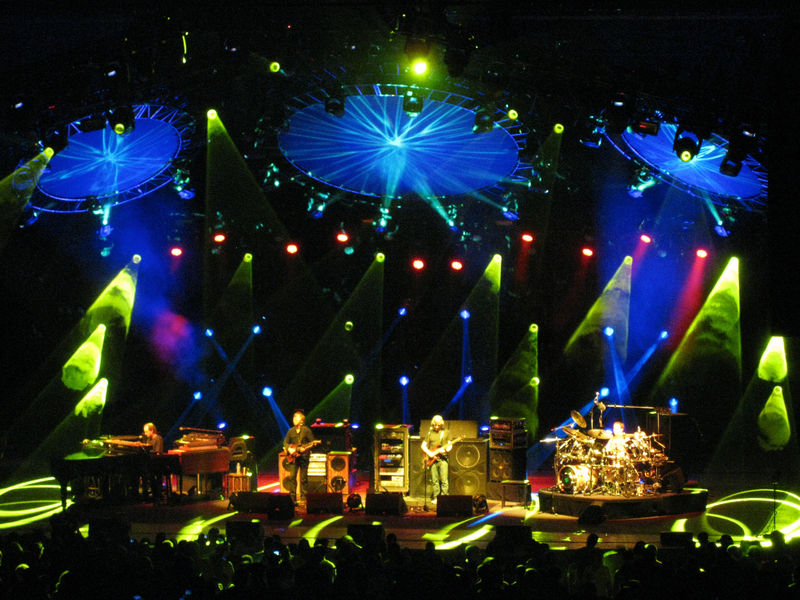 Page offered piano comps to this darkening passage as Trey just absolutely went to town. With the band adhered in a single-minded mission, each member brought eclectic and connected phrasings to an increasingly evil brew. This sequence jam blossomed into psychedelic monstrosity, and once it reached its peak, the band allowed their wall of sound and effect to gradually wash into a drone landscape. Removing the crowd from this sonic dungeon, Trey softy played the opening lick to “Mango Song,” bringing the dark into the light and resolving the band’s dip into the netherworld. Because the show’s relative mediocrity, this experimental “Rock and Roll”—that built directly from Phish’s Midwestern mayhem—has been wrongfully slighted in post-tour playlists and analysis. Maybe you are familiar with this jam or perhaps you’re not, but either way, click play and let this dark-horse adventure take your mind for a spin. A smoking highlight from the first night of Alpharetta’s two-night stand. Following last Friday’s ten tunes that were focused on some of the outstanding improvisational passages from June, today let’s look at some other stellar jaunts from the month. With so much amazing music from June and Super Ball, some of the deeper cuts of leg one just might get lost in the shuffle. These selections, all coming from second sets, have other jams in the same frame that overshadow them (except “Steam”), so let’s take a moment to give these jams their propers. When Phish dropped into this “2001” within a set of heavy grooves, nobody expected what was to follow. Though always fun to hear, despite a few select versions, “2001” hasn’t exactly been the jump off during this era, but that all changed this time around. Weaving the rhythm of “Golden Age” throughout the opening segment, the band infused the space-funk with added zest while a palpable energy filled the pavilion. 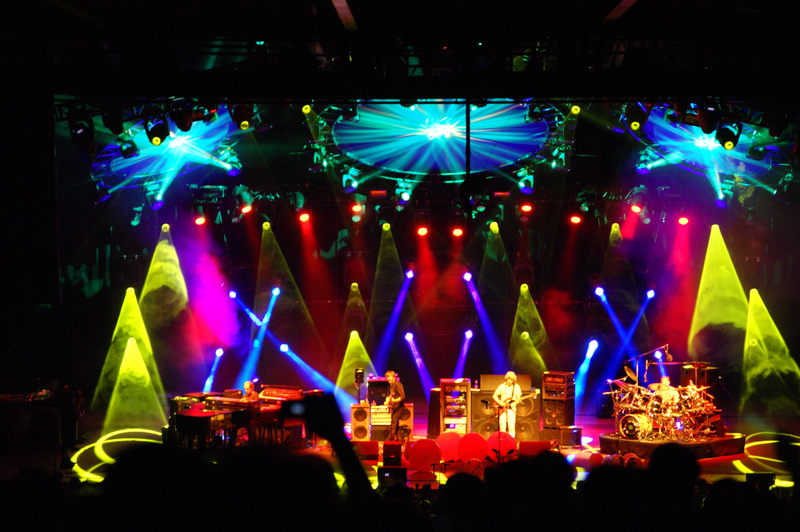 Following the first theme, the band continued to play with “Golden Age” within the grooves before Trey decided to throw a “What’s the Use?” tease into the mix. Picking up on this idea immediately, the entire band hopped onboard and got into some of one of the coolest segments of “2001” we’ve heard in a while. After dropping a tour-defining jam combo in “Rock and Roll > Ghost” at the beginning of this set, the band took a small exhale in “Free” before launching into the first second-set “Reba” since Knoxville ’09 (and before that, Allstate 2000). Obviously feeling it, the band attacked one of their most complex compositions and blissful jams with fury. And they absolutely slaughtered IT. Precisely cruising through the fugue, the band splashed into the cathartic groove with fierce intent. Standing out with superb full-band interplay and an unrelenting peak, this is one of the top-shelf versions of the modern era. All of a sudden, in 2011, “You Enjoy Myself” has become a rarity! Only appearing three times in 21 shows, this version that closed Cincy gets my nod for Leg One’s gold medal. Veering the band away from “YEM’s” classic theme, Trey infused divergent leads into the mix and the band followed his direction. One of the most creative renditions in recent memory, this “YEM” contains a whole lot more than a bit of funk.